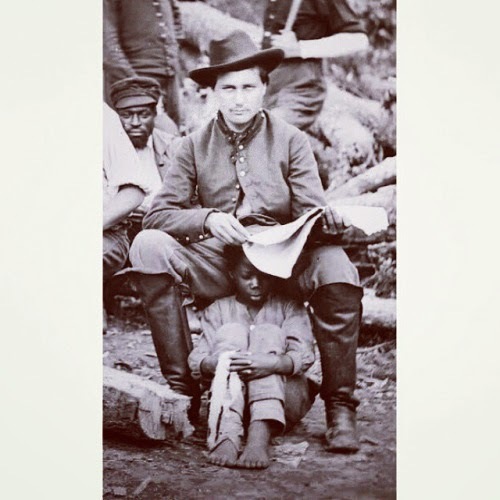 I snapped this photo of Cyrus P. Humphries using his slave as a stool. "Cyrus", I said, "I do believe the Northerners have a point. Slavery has gone too far when you need your own personal balls warmer." "Mr. Arlott", he responded, "Quintell here is serving as my stool. The warmth he conveys to my danglers is incidental to his primary function as a seat." "But Cyrus, do you not think it would be better to end the South's dependence on living furniture?" "Never!" cried Cyrus. "I'll be damned if I am to see my dining room set granted its freedom."